Jagiellonia Bialystok stopper Ugo Ukah has expressed delight after his team qualified for the semifinals of the Polish Cup on Tuesday evening. Following their 3 - 2 defeat of Lechia GdaÅ�sk on aggregate, Ukah and his teammates will face Zawisza Bydgoszcz at home in the first leg of the semifinals on April 8 before the reverse fixture a week later. “Yes we are happy to be through to the semi finals! I think we are the better side out of the four remaining teams and that we have a big chance in winning the title! “It is going to be tough cause obviously, also the other teams are willing to win the cup but I feel confident in saying we are the better side,” Ukah, who has one cap for the Super Eagles, told allnigeriasoccer.com. “The game was a hard one cause we knew Lechia would come high and try to score in the first period of the game but our defense was good enough to avoid that to happen. Ahead of the meeting with Górnik Zabrze on Sunday, Ukah is targeting a win with the hope of maintaining their playoff position. “Now we are preparing for a very important game on Sunday with Gornik Zabrze. 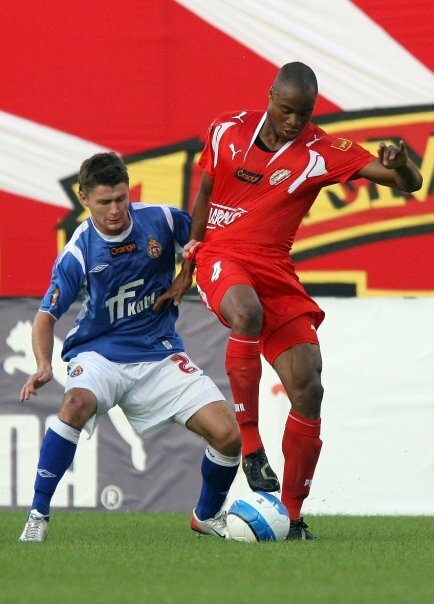 Prejuce Nakoulma, a Burkina Faso international, leads they front. “We will try to win to make sure we have a spot in the play offs for the title contenders for Polish Ekstarklasa,” adds the former Queens Park Rangers man. Ugo Ukah still has a contract with Jagiellonia Bialystok until the end of this season.